Welcoming our sweet little Alexander. This week has been an emotional roller coaster...starting on Monday, when we went in for my 38 week checkup and never came out of the hospital! Dr. McMahon made the call the check me in after seeing his NST tests. I kept thinking, "this couldn't be happening - we have lunch at the Cheesecake Factory at noon and my hair is getting cut + colored at 3!". I immediately called my brother, who came up to be with the boys while we were waiting to see what was next. Jonathan started making his way up from Olympia, and Kristine got their house ready for a big Wee Ski Sleepover at their house. Thomas was thrilled for that. Mike ended up checking me into the hospital as my sweet baby John Paul was clingy for the first time in his life. The gals at Dr. McMahon's office were amazing - as always. Michelle gathered both boys together and took them to find snacks while I refocused on what was now happening. She is an angel. Kristina was practical - as always - and kept things positive even as we were heading out the door in a wheelchair. My blood pressure was rising, and things were going to happen sooner rather than later. Almost five hours later, we were holding sweet little 3.0 in our arms. He is beautiful. 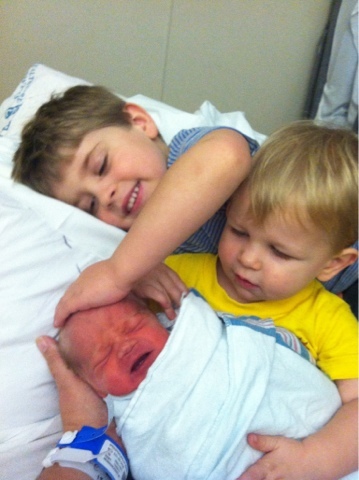 His brothers are over the moon with him, and Jonathan and I are so relieved that he is healthy. It has been a long week. The short version? Both Alexander and I are still in the hospital, and we are not sure when we are leaving. He is in the Special Care Nursery here at St. Joe's and I am one floor down. Right now, we have no definitive day that we are leaving. :( I have had some significant challenges with post-pregnancy blood pressure issues, and he is going through a 48 hour antibiotic treatment in the nursery. - Dr. McMahon and Dr. Read. I cannot say enough good things about them. Dr. McMahon walked in the room when I was holding a sleeping and scared John Paul...and she said, "i know you wanted the 12th because it was Our Lady of Guadalupe's feast day...and St. Alexander's feast day. But the 3rd is a good day too, I just looked it up. You know why? Today is the feast day of St. Francis Xavier!". And Xavier had been the middle name chosen. It was a little blessing from above. She was amazing with his birth. Since then, Dr. Read has been woken up on call for me more times than I can count - and this morning sat down with me and just held my hand after a particularly stressful overnight. He has been a great blessing to me and us as well. - my brother, Mike. From taking the boys to helping out with car seats to coordinating everythign with jonathan to bringing me a diet coke in the early morning hours to especially sending Fr. Nick Wichert to the hospital...Irreplaceable. Fr. Nick gave both Alexander and I the anointing of the sick on the last night we were able to room together before things got challenging...Which was an incredibly treasured moment on an evening with many uncertainties. - my parents. My mom has been sick and hasn't met her newest grandson yet...but she supported from afar. My dad has come by each day to check in and see how things are. Yesterday, we sat in the nursery and fed Alexander and talked. - a few visitors who did the amazing little things to make things better -- my aunt Sue, who brought a stash of sweet smelling lotions and goodies and organized my room, Stella who came to visit since we missed the Cheesecake date, Lindsay (a great friend who is also a NICU nurse in Seattle) who brought a good pep talk, magazines and Reese's, and all of our friends who have sent wishes, love, and especially prayers for and to us. And the most important -- my rock solid husband, Jonathan. He is mom, dad, husband, wife, everything right now for our family. I cannot imagine this journey without being by his side...even if our journeys aren't quiet "next" to each other right now. There's more to come, but just wanted to update you all right now! Please keep us in your prayers as we move toward going home!! Continuing to keep ALL of you, especially Shelley & Alexander in our prayers!!! Lots of virtual and hugs!! Sending hugs and prayers to all you. Sending you hugs from Wisconsin! Take care of yourself as we pray for those on the ground taking care of you. Congrats and love you friend! Your needs and my riches are a perfect fit. I never meant for you to be self-sufficient. Instead, I designed you to need me not only for daily bread but also for fulfillment of your deep yearnings. I carefully crafted your longings and feelings on incompleteness to point you to Me. Therefore, do not try to bury or deny these feelings, Beware also of trying to pacify these longings with lesser gods: people, possessions, power. Come to Me in all your neediness, with defenses down and with desire to be blessed. As you spend time in My Presence, your deepest longings are fulfilled. Rejoice in your neediness, which enables you to find intimate completion in Me.